The official Coot Wiki is now part of the CCP4 wiki. This page deals with issues specific to installation on OS X. This is nothing more than a repackaged fink installation, combined with an automatic nightly build system. It should have the most current bleeding-edge pre-release. If you need something more current than what is in fink, or you just don't want to install fink, then use this. whenever you require the latest version. 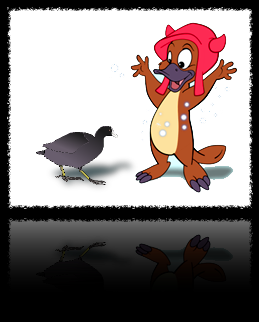 A more detailed description on how to install coot with fink is linked here. The fink package for coot recommends installing raster3d and/or povray. When this is set up, simply pressing on the "F8" key on your keyboard will result in a ray-traced image of the display popping up in Preview. Preview in turn will let you enhance the image, as it comes out a bit subdued by default. The following screenshot shows how this enhancement works. (You can see I tweaked exposure slightly, and gamma a bit, and saturation a fair amount). Click here or on the image above to see a full-sized screenshot. I wrote a coot wrapper shell script that lets you convert xplor/cns maps on the fly (you need to install mapman first) and has a few other enhancements. 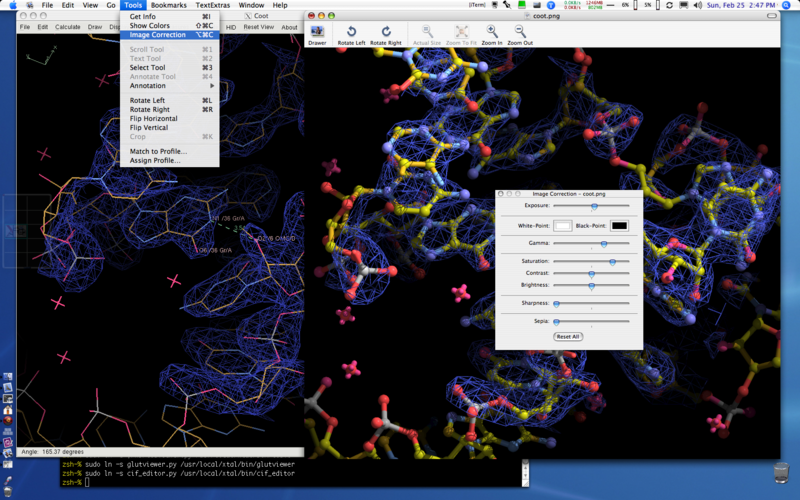 I also made a Coot OS X applet that allows you to drag and drop a cns/xplor or ccp4 mapfile or any other coot-compatable file (mtz or pdb file, for example). Using the File > Get Info dialog, you can program this applet to open all .map and all .mtz files, if you want to, making these files double-clickable. The least expensive and perhaps best option for stereographic display is the new Zalman LCD monitor. Please refer to the COOT wiki page that describes how to set everything up. Please note: Apple broke stereo support in earlier versions of 10.5, but with 10.5.6, it is now reported to be working correctly. Apple now supports stereo in a window with Apple's implementation of X11, so coot should be able to work with this if you have the appropriate hardware (CRT and video card, as well as transmitter and glasses). I do not, so I will have to leave this for someone who does. Hardware stereo on coot requires you compile with gtkglext1. The fink version of coot forces you to do so, so it should just work. This page was last modified on 17 August 2013, at 16:47. This page has been accessed 283,528 times.